All canoe and kayak rentals include a Safety Kit and Paddles. Kevlar’s major feature is its light weight and resistance to tearing. Unfortunately, it can be punctured and these canoes are not recommended for river running. 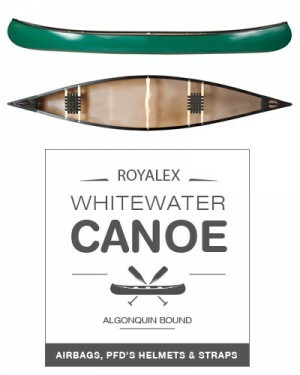 We do recommend the Expedition model for those looking to canoe Algonquin Park for the weekend. They are available in 15 ft (4.6 m) to 16.5 ft (5 m) in length and weigh on average 53 lbs (24 kg). 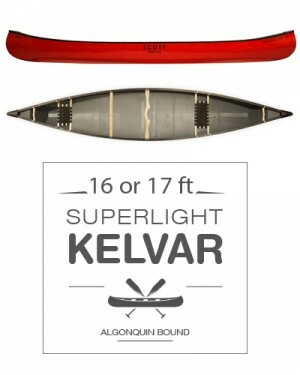 Superlight Kevlar canoes incorporate the same construction as the Expedition Kevlar boats but contain less material. This makes them much lighter without giving up much in the way of strength. These are great canoes for longer trips that require frequent portaging. 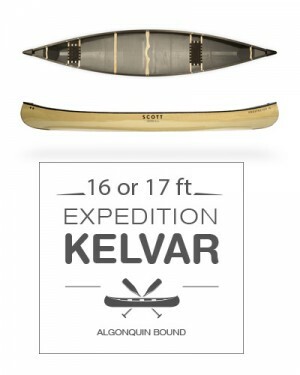 Algonquin Bound offers this boat in 16 ft (5 m) to 17 ft (5.2 m) sizes, weighing on average 45 lbs (20.5 kg). Paddlers requiring the lightest boats possible for carrying, portaging and paddling Algonquin Park often choose a Featherweight Kevlar. These are the cream of the crop in the canoe world and are the best choice for most canoe trips. 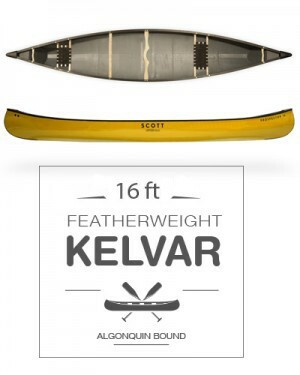 Featherweights range from 16 ft (5 m) to 17 ft (5.2 m) long and weigh approximately 42 lbs (19.5 kg). For those wanting the best, this is the canoe for you! Ideal for those independent travellers looking for small, but stable canoes to venture out on your own. 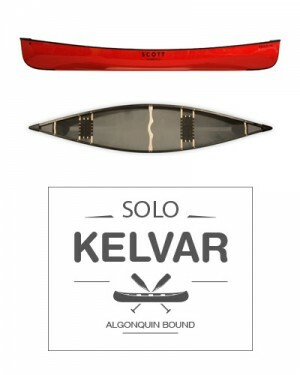 We offer 14-15 ft (4.3-4.6 m) superlight tandem canoes or 12-13 ft (3.7-4 m) solo superlight cedar strip canoes that are ideal for any solo trek into Algonquin Provincial Park. These canoes have more secondary stability and are a great paddle, especially on your own. All come with deep dish yokes. For those of you who are heading out with a smaller paddling buddy and have some portaging to do, this boat is the perfect choice. At just over 17 ft (5.2 m) in length, there is plenty of space for three paddlers (or one rider) and all your gear for a short 2-4 day trip. 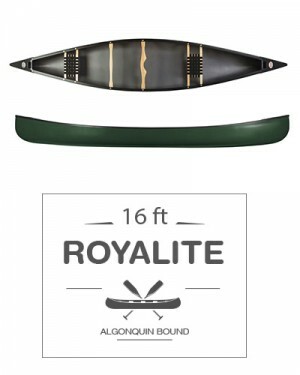 The Royalite canoe is a great choice if you are looking for a tough craft but expect to do some portaging. These canoes are extremely flexible and have a durable hull suitable for basic whitewater paddling and for beginners. 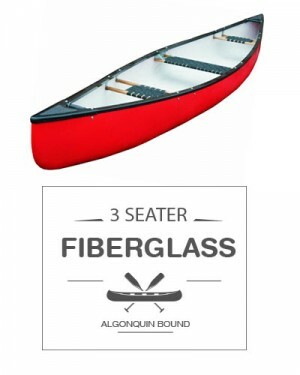 These 16 ft (5 m) long canoes weigh 55 lbs (25 kg) and are perfect for longer Algonquin Park canoe routes that may require a bit of river travel. This canoe is the perfect boat for tackling Algonquin Park whitewater rivers. Flexible and with a durable hull, these boats are 16 ft (5 m) long and weigh a little more than 55 lbs (25 kg). Still suitable for portaging if needed, these canoes allow for effortless exploration of your favorite river while retaining the ability to track well when the water slows down and spreads out. Fiberglass canoes are tough and are ideal for groups carrying a lot of gear or for trips that don’t involve a lot of portaging. They are great for beginners or school groups as the boats are forgiving in the water and stable. They are available in 15 ft (4.7 m) and 16 ft (5 m) lengths and weigh a hefty 68 lbs (31 kg) making them ideal for shorter Algonquin Park canoe trips without a lot of portages. For those of you taking along a smaller paddling buddy, this boat is perfect. At just over 17 ft (5.2 m) in length, there is plenty of space for three paddlers (or one rider) and all your gear for a short 2-4 day trip. 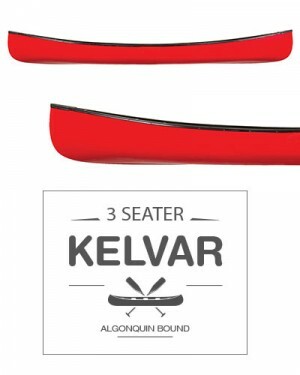 If you are looking to upgrade and perhaps do a few portages, we highly recommend taking our three seater Kevlar canoe. 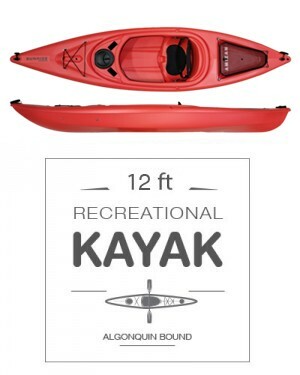 Ideal for the exploration of the larger lakes or even a run down quieter sections of the Madawaska River, the recreational kayak is safe and comfortable to paddle in. They are more mobile and shorter than canoes and preferred by many for day paddling and have extra storage.. They are 12 ft (5.4 m) in length and only 40 lbs (18 kg). However, they are not easy to carry over portages so kayaks are best on rivers or bigger lakes.